Managing a field service company can be a logistics nightmare. If you don't have a proper system for tracking invoices and payments you could be losing revenue from lost or late invoices. Even worse, employees may be able to easily pocket money from customers or walk off with inventory or company equipment. And customer service can be affected if you don't have a customer relationship management (CRM) system that stores contact info and service history. Fortunately, there are many options to help streamline the process for any type of field service business, whether you do window cleaning, plumbing, appliance repair, or IT support. Here I review four different field service management solutions, all offering free trials with pricing starting at $39/month and even one completely free solution. Mhelpdesk offers a 14-day free trial, then pricing starts at $75/month for the first user and $25/month for each additional user. On the first login you're prompted to complete a wizard-based setup. It allows importing of customer data via CSV (with their specific field/header names) or QuickBooks. Creating services and inputting product inventory is easy and allows you to track wholesale pricing and reordering. Though the products and services list can be exported, you can't import the data. When inputting customer information, you can define custom fields for any specific data you want to store. Plus you can easily create and email a username and password for the customer, allowing them to login to view service history. 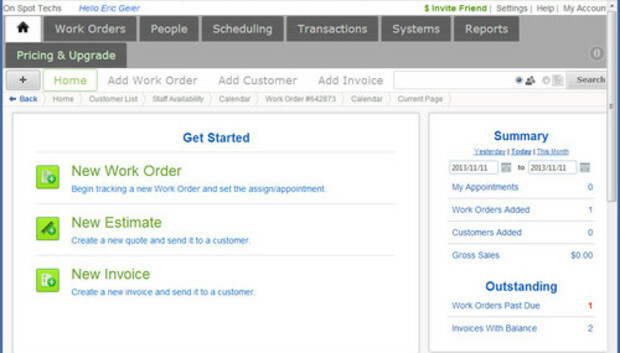 Creating work orders is done via a streamlined interface that allows you to easily move from an estimate to invoice and payment, with the ability to also input time and materials, logs/notes, messages to the customer, and upload related files. Here it would be great to see more flexibility in entering and tracking field tech availability and the ability to send SMS alerts to field workers. Mhelpdesk offers a free mobile app for iOS and Android devices. You can view and edit work orders and customer info. It offers pretty much the same functionality as the Web-based interface for the work orders, but editing invoices and estimates could be more user-friendly. Overall Mhelpdesk is a solid service, offering most of the features you'd probably need. It also offers a great setup and support option: a one-time fee of $350 for one-on-one help in customizing the service and even employee training on the solution. Though it doesn't provide a direct way to track non-availability times for field workers other than seeing assigned jobs, it can easily be done via creating events on the calendar. Connect2Field offers a 14-day free trial, then pricing starts at $65/month for each admin and $10/month for each field worker. Online documentation steps you through the initial configuration. Connect2Field features importing and exporting of clients, products/services, jobs, and suppliers. It requires the data to be in its format but offers templates to copy or type in the data. Inputting the services and products isn't difficult, although it would be nice to see some service or labor specific attributes. It offers a great inventory tracking system that supports assigning items to warehouses with the ability to transfer between them. Adding customers and creating work orders is straightforward, with both SMS and email alerts supported for field worker notification. Customer addresses are instantly verified and the distance from your office displayed. However, with the calendar and scheduling features you can't easily specify non-availability time for field workers besides seeing assigned jobs or those completely unavailable when marked as inactive. If a worker wanted to enter non-availability time on the calendar they'd have to create a blank job during the desired time(s). Field workers can login via Web browser or use a mobile app for iOS or Android. They can view and update jobs, enter payments, capture signatures, and complete invoices. One convenient feature is the ability for them to track their travel time/distance and job times. Quotes, invoices, job orders, and job questionnaires are all customizable. Connect2Field offers a couple of reports for jobs, clients, and workers, plus the ability to create custom dynamic reports. It also offers integration with several accounting systems, including QuickBooks, Saasu, Xero, MYOB, and KashFlow. Like Mhelpdesk, Connect2Field offers a customer portal where they can login to see their service history. I found Connect2Field to be a feature-rich solution, despite lacking the ability for field workers to easily set non-availability time. It offers great customization and supports many accounting systems. Jobber offers a 30-day free trial and then pricing starts at $39/month for the first two users and $9/month for each additional user. A setup wizard helps you configure basic settings and a get started section shows a checklist of setup steps. You can import and export client data via CSV format or Vcard. Creating products and services is simple, but it doesn't support any inventory or reordering functionality. It does however offer tracking of employee purchases and reimbursement. Creating customers, jobs, and invoices were all straightforward. However, it would be nice if the job description supported multiple lines of text and the ability to send SMS alerts to field workers. Jobber offers a route feature to help generate driving directions and optimum routes. Though Jobber doesn't offer mobile apps, their website is mobile-friendly. Jobber offers a couple of dynamic reports on money, services and work, and clients. They also offer some free and premium add-ons for tracking expenses, worker time management, ePayments, route optimization, website integration, QuickBooks syncing, and more. Overall Jobber is an economical solution with most features you might need, besides lacking inventory management. Though it doesn't provide a direct way to track non-availability times for field workers other than seeing assigned jobs, this can easily be done via creating events on the calendar. AceRoute is currently a free service, but offers a limited set of features compared to the other solutions. It provides no setup wizard but the FAQ guides you through the initial configuration. Though it offers importing of data (via CSV or QuickBooks), for exporting it only offers printing of data. You can create services and products, but it's a simple system with no inventory or reorder tracking. Inputting customer data and scheduling appointments is easy, and it offers live Google address feedback and validation. Its smart route optimization can automatically generate best routes for multiple jobs in a day if on-site times are flexible. Though you can generate and print billing reports showing parts and labor for jobs it doesn't fully support invoicing and you may have to input the data into another invoicing system. AceRoute doesn't provide any mobile app and their web interface isn't optimized for mobile devices, so any in-field updates for jobs would be best if done via a desktop or laptop. I found AceRoute to currently be a simple and economical solution for very small businesses. Though it lacks many features it still may work for larger businesses with another invoicing system and those that don't require mobile access to job data in the field.